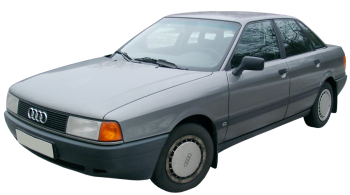 Manufacturing version CD Turbo Diesel of automobile models 80 was launched in 1984 by Audi, and finished in 1986. In this car can sit 5 people total, it has sedan body type with four doors, and length 4.4 meters, weight 1 tons. «80 CD Turbo Diesel» vehicle with a 5-speed manual gearbox is connected to the front-wheels. 4-cylinders diesel motor with «indirect injection fuel system» can generate power 70 hp at 4500 rmp, which allows you to accelerate the auto for 14.4 s to 100 km/h and achieve max speed of 160 km/h. Fuel tank volume of this auto is 68 liters of diesel, thereby when average fuel rate is 6 l per 100 km, what allow you drive roughly 1134 km unrefuelled. The forward wheels of this auto have disks brakes and attached to the chassis with help of suspension type «MacPherson, independent, coil springs» and equipped anti-roll bar. Rear wheels have drums brakes and fixed to the body chassis through suspension type «Rigid, coil springs» and equipped with stabilizer bar. Tires have the next measure - 175/70R13. Audi 80 is not examined for crash test Euro NCAP. This car does not have passive and active safety systems.